Mutton cloth - also known as Stockinette - is a versatile Industrial fabric manufactured on circular knitting machines. (The name mutton cloth is derived from its original use for the wrapping of frozen meat.) Nowadays the product is recognised for its absorbancy, softness & wet strength and is widely used for general cleaning, washing and polishing in industry, workshops, garages and in the home. 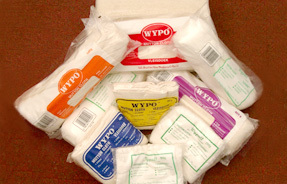 Mutton Cloth Supplied in 400g, 500g and 1kg rolls. Also available in colourful individually wrapped barcoded packages of 100g, 150g, 250g, 400g and 500g. Also available in colourful individually wrapped barcoded packages (400g and 500g sizes).